All the research shows that meaningful conversation is a vital social activity for us all and our wellbeing. Knowing about and understanding of people’s life histories is at the heart of good relationship-centred care. Yet how can we communicate well with people brought up in such a different world to our own? Many Happy Returns cards help people to do this – easily. Recommended by The Times, Saga and a host of caring organisations across the country, the memory trigger cards are perfect conversation starters for young and old – an ideal way to encourage commonality, stories and enjoyable exchange between people of different ages. They help older generations share happy memories and give younger carers valuable insights into life as it was once lived. 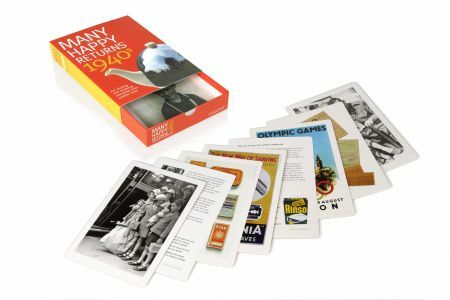 Many Happy Returns 1940s Reminiscence Cards help kick-start lively and enjoyable conversation with people over 75 years old and younger generations, so that everyone can learn about each other and enjoy and celebrate their stories. The 26 cards with everyday subjects from the decade were researched with over 120 people and are illustrated with large images on one side, with interesting background information, helpful trigger questions and conversational prompts on the other. Everyday subjects include cleaning the step, comics, conkers, shopping, shaving and sugar mice, pinafore aprons and playing in the street.